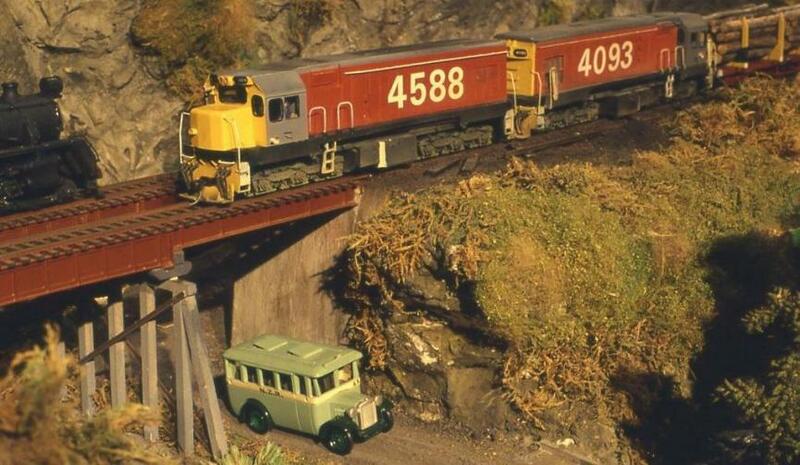 Modelling the railways of New Zealand. In the early days of railways in New Zealand there was no common gauge. Rails were laid to anything up to 5’3”. In the 1870’s the Government of the day decreed that all new public railways would be laid to 3’6” and existing broad gauge lines be re-laid to the new standard. Most private railways settled on 3’6” as well, but other gauges were in use in various locations. Our early legislators didn’t realise the problems they would cause when it came to modelling our railways with their use of a narrow gauge. Luckily the combination of HO track and models built to S Scale (1:64), gave early modellers the chance to make a start with NZR as 16.5mm (HO gauge) is almost exactly 3'6". In the early days there was little available, either here or overseas, that was suitable to our needs. As the numbers increased, modellers developed techniques of casting local prototypes in polyester resin, and local manufacture started in the late 1960’s..
Today, there is a thriving local model railway manufacturing industry. The predominant scale used in New Zealand today is 1:64, known colloquially as either Sn3½ or threesixteenth. There is an extensive range of locomotives, rolling stock, structures and fixtures and fittings available in 1:64. The majority of the locomotive kits are whitemetal, but there is a growing range of high quality etched and resin kits becoming available. Rolling stock kits are either whitemetal, resin or etched. A number of laser cut buildings and other items are also available. There are a number of other popular scales but with far fewer devotees than 1:64. 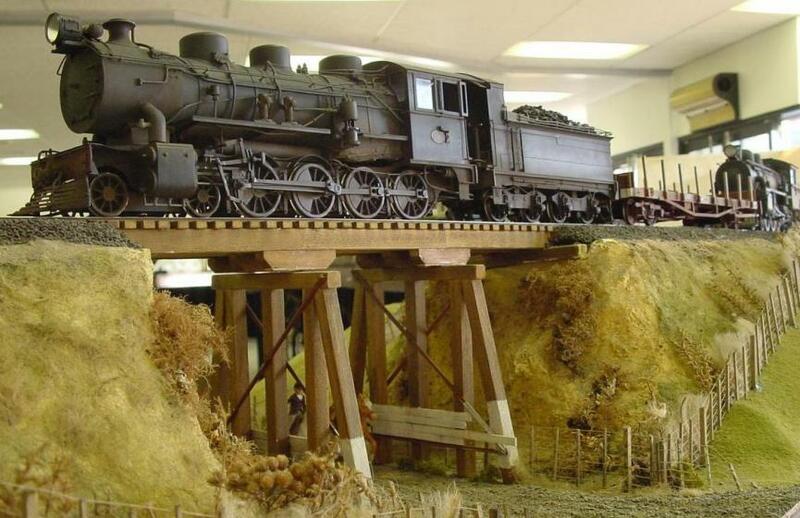 The scale based around O gauge (32mm) track is 1:34 a.k.a 9 mill or NZR P:34. A large range of castings, both whitemetal and brass, are available for the scratch builder. Kits in polyester or whitemetal are available for a number of rolling stock items along with a growing number of etched locomotive kits. Click here for a copy of the NZR34 track and wheel standards (P34 standards for NZR track). 1:87 or HOn3½ on 12mm gauge track has a small but devoted following, with a number of kits available. There are also a number of NZ lookalike locomotives manufactured by the Freteschi company in Brazil. These run on 16.5mm gauge track, and are a good entry level option for NZ modelling. NZ120 is the name given to the modelling of New Zealand's narrow-gauge railways in a scale of 1:120, also known as TT scale. The combination of modelling a prototype track gauge of 3.5 feet (1067mm) in TT scale is also referred to as TTn3.5, or TT9 for the 9mm gauge of the track - the same as standard gauge N scale. Railway modelling in this country is no different in practice than in any other country. There are modellers who have their own layouts; some just run trains and others run theirs with timetable operation. Likewise, there are those who enjoy building the models while some go to great lengths in their quest for detail. The New Zealand scene is also used as a basis for freelancing. There is no one size fits all. Model Rail magazine's latest annual is their How To Build A Model Railway. This magazine includes absolutely everything you'd ever need to know in order to construct a layout. Over 100 pages of handy step-by-step guides and expert knowledge gained through years of model making experience, it can be purchased directly from Hattan's Model Railways in the UK - link here. How, when, where, do I start? There is not the space here to tell you exactly how to do it, but in general you should start by reading, learning and planning. There are many excellent magazines available on railway modelling. Our quarterly magazine, The NZ Model Railway Journal, focuses on modelling the railways of New Zealand. Other sources of information are railway books - most main libraries have some available - and magazines on full sized rail practice. The New Zealand Railfan is well worth looking at for current news and in-depth stories of historical importance . The New Zealand Railway and Locomotive Society Inc. publish The Observer, a journal of record of NZ railways. They also publish many books and have a large archive in Wellington of the old documents of the N.Z. Government Railways, including photos and drawings.